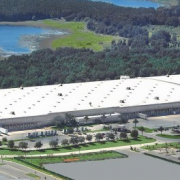 In one of the largest industrial deals in the Orlando market of the last decade, Samsung SDS America signed a 562,816-square-foot lease at 19925 Independence Blvd. in Groveland. The single-story, 706,722-square-foot industrial building was built in 1999 and will serve as Samsung’s new Southeast distribution headquarters for their appliance division. The company is relocating from its existing Jacksonville location for the logistical advantages of being in the middle of the Sunshine State. Josh Lipoff and Joe Hills of JLL represented Samsung, while David Murphy and Monica Wonus of CBRE Group, Inc. represented the landlord, Real Capital Solutions. Murphy and Wonus both hold the CCIM designation and Wonus is a member of the Florida CCIM Chapter’s Central District. The building contains the largest block of available warehouse space in the tight Orlando market, where several large projects of up to 1.2 million square feet aren’t scheduled to break ground until later this year or 2018.